Deep-fried tofu made with domestic whole soybeans and natural bittern. 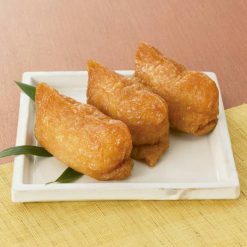 Made with domestic whole soybeans and natural bittern, this deep-fried tofu has been prepared with a slightly strong Kanto-style seasoning. Commercial deep-fried tofu products usually use additives such as calcium chloride and calcium sulfate as a coagulant, and the seasoning broth contains seasoning such as amino acids, pH adjusting agents, and protein hydrolyzate etc. Sugarlady’s deep-fried tofu only uses natural additives: no artificial additives are ever used. As tofu is a protein rich soy product, it is an ideal food for people who prefer vegetarian and vegan diet. People with soy allergy should take caution or avoid this product. Thaw by removing the outer bag and soaking the inner bag in hot water. Take out the thawed contents from the inner bag and strain the excess broth before use. When stuffing the rice, please be careful with separating the opening, or the skin may tear.When cooking the rice, add a piece of Kombu seaweed for a subtle, added flavor. For better Inari, cook finely chopped carrots, burdock, Kanpyo (dried gourd) in dashi (bonito broth, soy sauce, sake, sugar). Then add it to the cooked rice and stir in the Sushi vinegar (rice vinegar, salt and mirin), topping it with some black or white sesame seeds. Rice should be cooked with slightly less water than usual, as vinegar is added later. 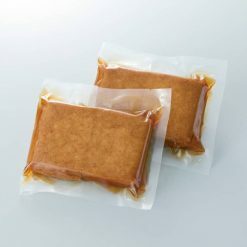 This product contains deep-fried tofu (domestic soybean, rapeseed oil, crude seawater magnesium chloride (bittern)), sugar, soy sauce, starch syrup, bonito extract, mirin.